New Late Riser Bars and More! Our introduction of the Straight Bars a couple of months back was a big hit. We have a good feeling the Late Risers will follow suit. We offer these in more powdercoat colors than the Straight Bar. We are not offering black or silver, because there are plenty of black and silver riser bars out there--- even though they may not be perfectly suited for urban use. 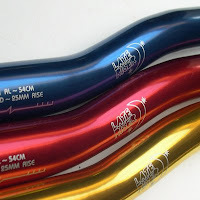 Unlike MTB/DH riser bars the Late Risers have less length and less backsweep. Having less sweep is more ergonomic as the width of the bar gets shorter. The wrists end up in a more natural position. That's our theory anyways. Fixie riders will no doubt want to cut down its 540mm length to something more their liking, but this length is quite suitable for townie bikes as is. Much better for slipping through traffic than the average stock riser bar. 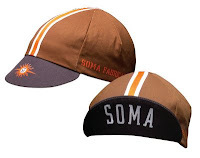 Also newly released is a new Soma cycling cap, our first. Plus a new line of mini-pumps. It is so small we call it the Atom. These will fit in jersey pockets and even small seat bags. No reason to go on a ride without one. This is from "mot_norm" (Motsu) in the Flickr community. He's a graphic designer and fellow cyclist living in Japan. This gal is his hairstylist, Yoshiko-san! She rides a custom painted Soma Rush. Check out the alternating colors on the chain. I think this was just a casual snap shot, but it makes for a great portrait. She's got her hairdresser's holster on. She's next to her whip. (She's color coordinated with her whip) And she's looking effortlessly chic and poised. She's beautiful. The shot's beautiful.